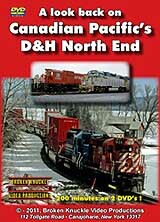 In late 1990, the Canadian Pacific acquired the D&H after several years of uncertainty. However, even the CP's deep pockets weren't an immediate answer to saving the line. Fortunately and eventually, the line has been revived. This program shows the trains on the D&H North End in 1991 at Saratoga Springs & vicinity, and then again in 1994 when we covered the line from just northwest of Albany to Rouses point. Footage is presented chronologically, and you'll witness many "un-retired" MLW's along with D&H lightning stripes and an assortment of Canadian Pacifics EMD/GMD power through the change of seasons. Our visit concludes with a trip on Amtrak's southbound "Adirondack" where we filmed from the rear vestibule on a perfect autumn day.